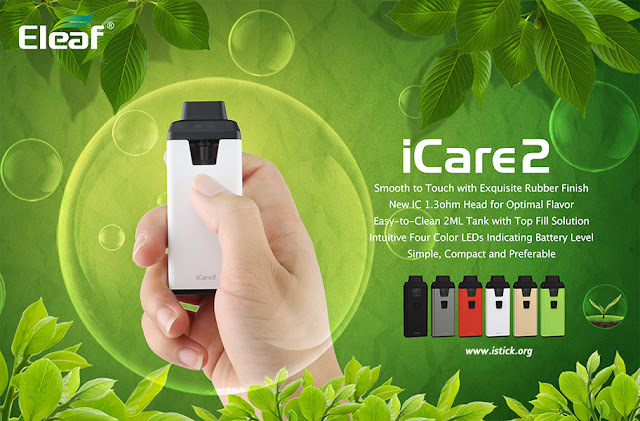 iCare 2 is a new vape starter kit of iCare series of Eleaf, it is a Simple, Compact and Preferable for the entry level of Vaper. It comes with smooth to touch with exquisite rubber finish, with New IC 1.3ohme Head for Optimal Flavor, features Easy-to-Clean 2ML Tank with top fill solution, Intuitive four color LEDs Indicating Battery Level, all of these would make you love it very much, there are six colors for you to choose, always a suitable one for you. Eleaf iCare 2 Vaper Starter Kit launched at iStick.org now, welcome to purchase, any questions you can contact our facebook page.